A Taste Of The New Comics Section! A new comics section is in the works and can be found here: sonichq.net/comics. It is still very much a work in progress but you can search through issues 1-189. Soon to come: All Sonic the Hedgehog comics, Sonic Universe, Sonic X, Specials and Knuckles. Please stay tuned! Sonic HQ, and MMHQ multimedia sections remastared? I believe that SHQ, and MMHQ music and multimedia sections should be remastared. I have all MIDI tracks even for Mega Man X. I'm offering SHQ for my redevelopment services of this section, free, because I think it would complete the new site. I have plans to add new songs and maybe a video section for the new multimedia section. The animation section has been "remastered"? for the newer layout and is just the first of this site's major overhaul. Comics is coming next so stay tuned! We will now be rolling out a new feature for SHQ. A revamped fanart section! To begin using it, you will need to be a member. You will see an option in account settings to enable it. From there you will be able to upload your fanart! Please note it is still a beta and refinements/more features are coming. So another demo of Sonic Generations was released yesterday for XBox 360. The PS3 version is slated to release on the 25th. The file is about 600 some MB but downloaded fairly quickly. Upon entering the start menu you are treated with being able to play Green Hill Zone which is presumed to be the first level in Sonic Generations as both Classic Sonic and Modern Sonic. The Classic Sonic iteration plays very similar to the demo released earlier but smoother and little to no frame rate stutters. The physics are what you'd expect and multiple paths galore. Modern Sonic plays extremely similar to Sonic Unleashed daytime. Defeating enemies and getting rings fills your boost meter which you can use to tear through sections and additional enemies. Ground stomping was also kept along with sliding under crevices. You can also rest assured the dreaded quick time events that plagued Sonic Unleashed will not be making an appearance. All in all, this title is looking solid and I cannot wait for November 1st. You'll be able to get it for XBox 360 and PS3 on November 1st. This goes for North America and Europe. Everyone else will get it November 4th. Still no word on the 3DS version yet. A re-release of major proportions! It also comes with the Japanese soundtrack and is remastered for higher resolution displays. We can also expect trophies, achievements respectively. No word exactly on when it will be released but sometime later this year. We'll keep you posted once we know! Remember to leave your response in the form of a question. 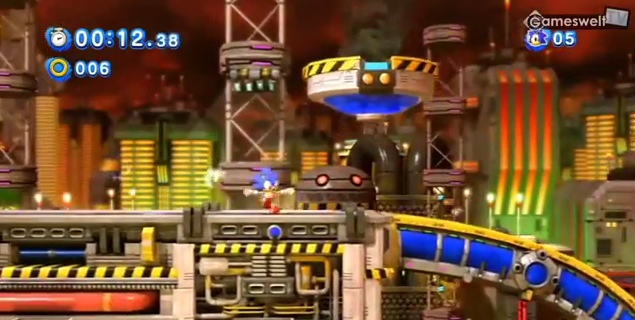 Features some gameplay of both classic and modern Sonic within chemical plant. Lighty wanted me to post something new so here it is. People compare 808 State: Pacific 707 to Sonic CD's Little Planet track. But they are only spiritual kin. It isn't like the notes are the same. OH WAIT. WHAT IS THIS BELOW? Hey! Those Sega tunes don't seem to be all that original anymore. But that was only one time...right? They wouldn't rip off other people right? Now this isn't even getting into others like Sonic 3 or the Rush series. Some of these are well known, some are obscure. Either way, TALK DANG IT. Also, it would be nice to have Sonic fanart to start each entry on this blog, you know like some certain other sites. Sticking someone's hard worked fanart that we didn't get permission for isn't good on the conscience. Sure, I guess on forums that is okay for some reason...but I suggest we keep things safe here. Finally...Blaze pony is the BEST PONY. Hi there! I am GT Koopa. Aka GT the Magikoopa aka Galapagosturtle (if you go back far enough). I am the official Sonic hacker of the Mofo. (and apparently the only one) Since I was told the new SHQ finally got off the ground, and that I could do stuff like this, I figured "HEY!" While I am probably known for being on Sonic Retro, SSRG, or Youtube, my first place was the Mofo and the good old Sonic HQ. I will let my hacks speak for themselves. So if you are bored and want something to do, try them out! My Youtube account. I made a lot of hacking videos, so check them out! You can now add comments to these posts made on the main page. Registration is required however. Sonic HQ Archive Now 98% Working! All broken links and images have been corrected. The only exception to this is the Directory section which is requesting files that are no longer in existence. The SHQ Archive can be located here. Also a reminder that the Archive is a "read only" sub portion of the site. There are many new features planned ahead for SHQ! Lots of plans! The Sonic Generations Demo has been out since June 23rd (Sonic's 20th Anniversary! Happy Birthday, Sonic!) This really does looks to be what the community has been waiting for and we'll break it down. Classic Sonic feels right. The mechanics feel right on. Jumping is the right height. Running speed feels right. Spin dashing works just like from the Genesis days. So yes, that means you will be able to spin dash + jump off a ramp to get that desired height. The controls are exactly what you'd think they should be. All buttons will jump. There is however one button spindashing so if you don't like holding down + jump to spin dash you can just spin dash with the tap of a button. Holding down + jump button will of course also allow you to spin dash. It's very intuitive. We did notice a slight delay in responsiveness in the controls and we hope this will be fixed but nothing too major. Green Hill is amazing. We noticed a little framerate issues here and there on the PS3 version but we're sure they'll be ironed out later on. Again, this is just a demo, however, we do feel confident in this becoming a solid title this come holiday season. We eagerly await for more! So What Is Going On With SHQ? Sonic HQ has had a long history on the internet. It originated on the internet WAAAY back in 1996 and was once known as Zifei's Sonic Page. It then manifested itself to become one of the most popular Sonic sites on the internet. However, as the years went by, more sites rose forth and dethroned Sonic HQ's status on the internet. It was originally established at sonichq.org, then sonic-hq.net and now sonichq.net. While its status on the internet may remain uncertain, it's usefulness shall remain. An archive of how the site was before shall remain while at the same time the rebirth of Sonic HQ is just beginning! Here you will be able to access all of Sonic HQ's archived content. Please note that the archive is just that. An archive. Its content will no longer be updated, however, since the content is still useful for those researching, it will stick around.